Economics and Equipment – Arms and armour, tools, clothing, accommodation... everything your character needs as he or she begins on their life of adventure. Combat – Mythras's combat system is unique, dynamic and geared towards adventurous realism. Gaining success over an opponent generates Special Effects that can rapidly turn the course of a fight. Copious advice is presented on balancing combat skills and styles, through to handling rabble and underlings. Creatures - Over 50 creatures are fully detailed, including several non-human player character races. This chapter also offers complete guidance on how to use creatures effectively in Mythras games, and notes on how to design your own. The Third Printing updated PDF is a very small file (9.9mb) and I notice there are lots of artifacts in the graphic rendering. In short, it looks terrible! Please update it again. Thanks for the feedback David. The source file is actually 40Mb, so something appears to have happened on the DTRPG end. I'll take a look for you. It's still a 9.9 MB file even after your update to correct the problem; I didn't check for graphics quality. I know. I've tried the upload about 5 times with the same results. Something being mangled on the DTRPG end, and if the current upload has the same issues, I'll be raising a trouble ticket. I'me very sorry for the issues; everything works fine on my end, and then goes awry at the upload end. I have no idea when DTRPG would be reducing a 40Mb file to a quarter of it's usual size. Right now the updated file is 18.6mb with correspondingly better graphic quality. Thanks Lawrence. I bought this back when it was runequest 6, anyone know if there's a difference between the 2 other than name? Not trying to be mean, but the answer to your question is literally in the first sentence. "Mythras is the new name for an older game, but while the name might have changed, the system remains the same, but presented in an updated format with new interior artwork and layout design, along with some new content (Special Effects, small tweaks to the rules, and Spirit Combat Effects)." I'm from the US and prefer the imperial measurements (Inch, Yard, Mile, etc...). It's easy to convert meter to yard but kilometer to mile, Centimeter to inche - slows the game. Is there a chance that there will ever be an imperial version? It's just what I know and I don't like converting. I have the Action system Wild West genre book and it uses metrics.. However, when you're in Dodge City Kansas and you say "The bandits have a 4 Kilometer lead on us" it just doesn't work for me - I have to convert. Once again it's just what I am familiar with NO OTHER REASON. I don't like to convert. I have always loved Runequest and d100. Magic World (BRP) uses imperial measures but it's NOT Runequest. I have RQ6 and soon to buy Mythras. I just don't like converting. It's highly unlikely that we'll publish a version of the core rules that's purely in US Imperial or has extensive conversion notes - although Classic Fantasy does contain such, reflecting the Imperial units of old school games. US imperial measurements (inches, yards, miles ...) are "old school"? I can understand not converting or adding conversion notes because metric is what you know. Makes sense, but "old school"? You certainly (I expect inadvertently)know how to alienate a customer and make them laugh at the same time! Anyway, thanks for the reply. Nice job on Mythras. I bought a copy. Hi Robert - you've misunderstood me. I wasn't meaning that Imperial measurements are Old School, but the feel of Old School games from the 80s. FWIW, I was brought up with both metric and imperial and still personally think in inches, feet, yards and miles. No Worries. I misunderstood. Thanks for the kind reply. I did purchase Classic Fantasy.. CF does fill some gaps for me and it is well done. I will play Mythras as well. Happy gaming. What is the difference between the two pdf files? Which one is most recent? TDM110_Mythras_Interactive_Revision_2.pdf is the most recent. It contains errata and higher resolution covers. Didn't reply to my previous question yet Lawerence. Also the other day I tried emailing you all via your website and also haven't gotten a reply. I emailed to ask if the "printed" versions were up to date with the Sept 2016 revision 2. I'm asking because there is a large difference in the sizes of the original file above and the revision2. Revision 2 is over 91k versus the original which is almost 37k. Is most of that just the art? I really like to hardcopies of books, I use the PDF's as backups and to custom make stuff like GM Screens from the various charts. My question is can we buy the September 2016 revision 2 in hardcopy? Or are the hard copies still all revision one? p.s: Rodney L, maybe you know this stuff? I notice that you're really fast to respond which is awesome btw. Ah well, so much for the communication. Seems that dried up. I'd tried the email as I mentioned, you sort of answered my question in email but then didn't answer my question about an errata. Would be nice if Design Mechanism offered an errata pdf for those who buy the hard copy so that they can update the printed version with the new Revision2 version. Seriously, good customer communication is a must. When I don't get it I know I personally tend to just shrug and walk away after a bit. I always loved Runequest btw, played 1st, 2nd and 3rd edition back in the late 70's and early 80s. My issue with it was always that it took a lot of work to make it work for a world other than Glorantha. Don't get me wrong, I really liked Stafford's game world but it wasn't quite what I wanted to run myself. So by the mid 80's when GURPS came out I jumped on that and it was my system for the next 15 years until I decided to take a break from tabletop rpg gaming. Now that I've returned I'm not real...See more happy with the current edition of GURPS and was looking at other skill based game mechanics systems. I recalled Runequest and when I found out what I'd missed I decided to give it a shot. So far from the PDF that I snagged and the Fantasy stuff that Rodney L did, I am impressed. What doesn't impress me is that simple questions aren't getting answered. I take that as not a good sign. I'm sorry you feel we don't communicate. 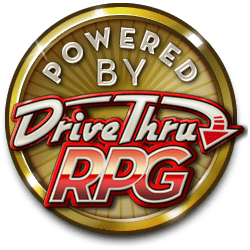 And I'm sorry I missed your February comments on this discussion thread, I must admit that the DTRPG review discussions are in infrequent point of call for me mainly because our chief sources of communication tend to be our own forum, BRP Central, our G+ page, and Facebook. It's quite difficult keeping track of so many fora, plus all the emails we get to individual emails and our group mailbox. I'm sincerely sorry that I haven't replied sooner here. On the point size, I'm quite willing to accept that some people may struggle with 9pt text, but as a publisher we have to consider the overall product not just in terms of the point size, but also the page count as a physical product, which translates to weight (for printing and shipping costs) and of course what people are prepared to accept in terms of overall page count. When we first released RQ6 we had a lot of criticism about it being 456 pages, and a fair few about the white space....See more Mythras was a chance to address that, reduce the production costs, and create a more polished product. There's always I trade-off, and I wish we could please everyone in every way, while still creating a book that's as cheap as possible to print, ship, and become profitable. On the errata, we do have an errata list over at our forum, and we will, once we have time, release a full document for download. Since Mythras' release though, we've concentrated on producing supporting material, and as a small operation, there simply haven't been enough hours in the day to complete everything all our customers might wish of us. It will happen though. Is the artwork different compared to Runequest 6? In some places, yes. There is some entirely new art to replace pieces we weren't too happy with, but otherwise the art is the same. There's actually a little more art in Mythras. Thank you that was pretty helpful. I think I lean towards Mythras then. Mythras, when it comes out in print, will also be less expensive than RQ6 was, since it has a lower page count. It has all the same content though (aside from Runequest IP), plus some new combat effects and improved Animism rules. Thats very good to hear. So runequest 6 had Glorantha pages as well? I was under the impression it used your own setting. Or maybe its just names and spells and professions you refer to? No, it didn't really have Gloranthan content. We referenced the runes Glorantha uses, but that's really as far as it went. Mythras actually has more rules content, in a lower page count, than RQ6 did. I really hope, among all the d100 variants, that this becomes the new go to system for people. I would like a Hardback of Mythras though, missed out on the RQ6 ones. I have RQ6 pdf, got it as a bundle when I bought it through Knoble Knight brand new through their Brick N' Mortar PDF program, I have no way to get updates through that system. Any chance of a print version coming out? Yes, it's being printed right now, but won't be a POD through here though. Thanks Lawrence. Where will it be sold via? DM's website? Yes, and FLGSs. We also have a UK print partner called Aeon Games Publishing if you're in the UK or Europe. Is it possible to get a discounted PDF and POD bundle, and if so, how? Hi Jim, If the print version is ordered through TDM's website, the PDF is included as well for free. What is the difference between the interactive version and the non interactive version of the pdfs? Have both, I can't spot the difference at a cursory glance. I noticed in Mythras Imperative that Astrogation, Computers and a few other more modern/futuristic skills were added. Does Mythras expand on the idea of using the system for scifi or was that just for Imperative? I think those skills are in there as tasters for the supplements, the high-tec skills come from Luther Arkwright (so far). Mythras core sticks to a fantasy setting, so the skills don't go beyond a medieval/Renaissance level of technology. No, they aren't. The skill list is, I think, pretty much identical to the RQ6 list and is clearly focussed on historical fantasy/ancient world settings. The Luther Arkwright setting/supplement book is indeed the place for all the modern applications of the game, although there are free supplements (including the Mythras Imperative quick play) that detail firearms etc. That's weird. I used to have RQ6 in my DriveThruRPG library but now it's not even showing up on the DriveThruRPG store at all. I didn't get an email for Mythras but it occurs to me I may have purchased RQ6 in the full RuneQuest 6 Bundle Of Holding a year and a half ago and that purchase likely doesn't count for the free upgrade. Hopefully I can find my original copy of RQ6 on one of my backup drives. The Design Mechanism won't be able to publicly list RuneQuest 6 anymore as they don't have the rights. However, check your library carefully, including the archive files and it should still be in there. Mine is, so they've not deleted it. If you still can't locate it, check with a drivethrurpg staffer to help. Not on website but still in my library. How does this compare to RuneQuest 6th Edition? Is it worth purchasing? I have RQ6. I have many versions of RuneQuest since the first boxed edition decades ago. Love the system. Can I get a discount code as a RQ6 buyer? The system is unchanged, save for some tweaks, a new layout and some new Combat Special Effects. If you've bought the PDF from here, you should have received an email from us giving you a discount on the file. There were some problems with it it, but they should be resolved. If you haven't received anything, please send me an email at designmechanism@gmail.com, along with your RQ6 order number, so we can send you the code. Can you let me know what went wrong? I can see if we can get it fixed for you. I just tried to use the discount link in my email and got this message "INVALID DISCOUNT MAX USES: THE SPECIAL DISCOUNT YOU ARE TRYING TO USE HAS ALREADY BEEN REDEEMED THE MAXIMUM NUMBER OF TIMES ALLOWED"
The discount code problem is now fixed. Do check your email. It still isn't working for me even though it says valid until 2017. the link shows invalid. Thomas. please drop me an email at designmechanism AT gmail DOT com. Dropped you an email, let me know if it isn't going through.